More than one in three people over age 30 have periodontal disease, which may lead to tooth loss if left untreated. By a conservative estimate, 35.7 million people in the United States suffer from periodontal disease. 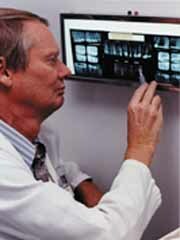 Ingvar Magnusson is an internationally recognized expert in periodontology who is attempting to rectify this problem. Through his work with the University of Florida’s Periodontal Disease Research Center, Magnusson has focused on developing new ways of diagnosing, treating and preventing periodontal diseases. Periodontal diseases are chronic bacterial infections that affect the gums and bone supporting the teeth. When you have periodontal disease, the supporting tissue and bone are destroyed and pockets develop. Eventually, if too much tooth support is lost, the teeth will lose their function and eventually exfoliate. Magnusson’s research has involved numerous clinical studies designed to detect early disease activity and to develop therapeutic treatments of periodontal disease, including antimicrobial and anti-inflammatory methods. He believes that in determining the effects of these different therapies, more rational approaches to preventing and treating periodontal disease will be discovered. Magnusson has also conducted studies to test better methods of assessing disease activity, and to study the potential for using a vaccine to control the progression of the disease within the mouth. The ultimate goal of periodontal therapy includes not only the arrest of progressive periodontal disease, but also the restoration of the gum area that has not been destroyed. Magnusson has conducted research involving periodontal regeneration using the concept of guided tissue regeneration. He and a colleague hold the patent for the invention of a material used for this procedure. Magnusson has participated in 45 funded research projects, many of which have been supported by such companies as Procter & Gamble, and total more than $5 million. He has served as the principal investigator for 27 of these projects.